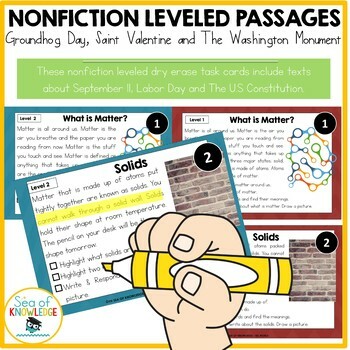 These nonfiction leveled reading comprehension passages include texts about States of Matter.Your first or second grade students will learn all about science and with these leveled nonfiction reading passages. These reading comprehension passages and questions can be used in a Kindergarten setting with support. The Bundle is now available! Save 20% + ALL future unit updates FREE! This pack would make a good addition to your unit about Australia. 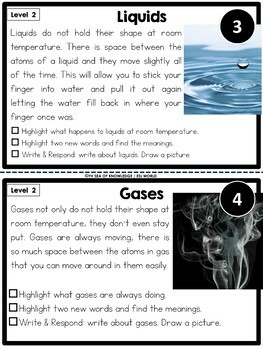 I created these for reading and comprehension fluency. These cards are non-fictional passages about fire safety. There are six cards in total with two levels. Level 1 is of grades 1-3 reading level and level 2 is of K-1 reading level. You may choose the set that you want to print out, laminate and reuse. I use the easier sets with my ESL students. Reading comprehension is one of the most important skills teachers can impart to their students. Help students develop critical thinking skills with this set. 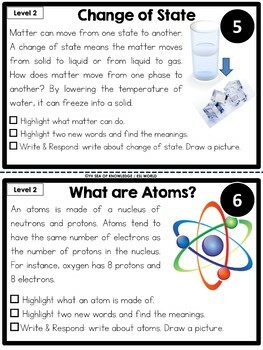 CC.1.RL.1 – Ask and answer questions about key details in a text. 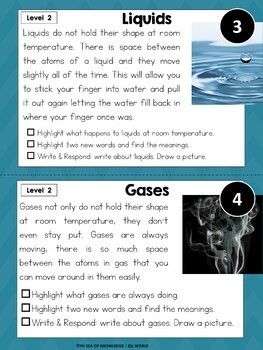 CC.1.RL.2 - Retell stories, including key details, and demonstrate understanding of their central message or lesson. CC.1.RF.3 – Know and apply grade-level phonics and word analysis skills in decoding words. CC.1.L.4 - Determine or clarify the meaning of unknown and multiple-meaning words and phrases based on grade 1 reading and content, choosing flexibly from an array of strategies. RF.1.4: Read with sufficient accuracy and fluency to support comprehension.